LEGOLAND Florida Resort: Hotel or Beach Retreat? Legoland Florida Resort: Is the Hotel or Beach Retreat Better? 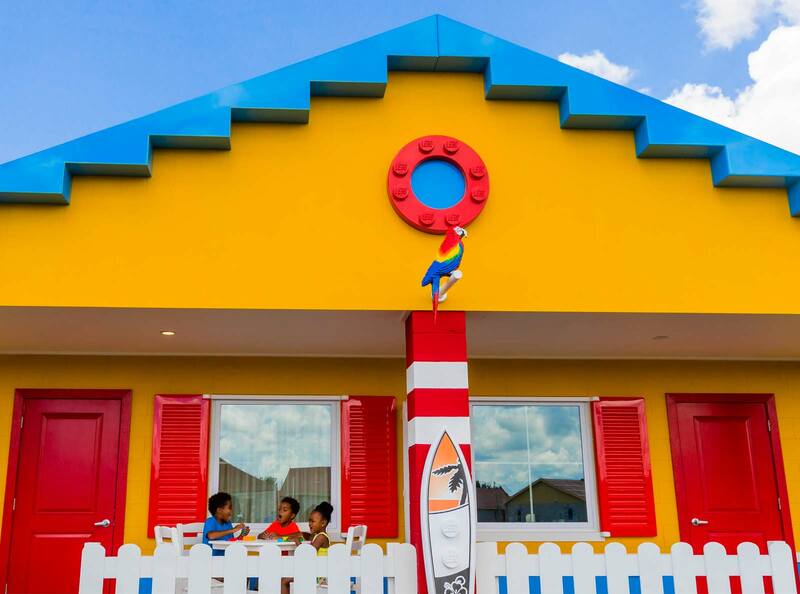 The colorful rooms at LEGOLAND Florida's Beach Retreat were a huge hit with the kids! Stay in LEGOLAND Florida's Beach Retreat - and feel like you're staying in the middle of a LEGO village. LEGOLAND Florida Hotel is fit for royalty! 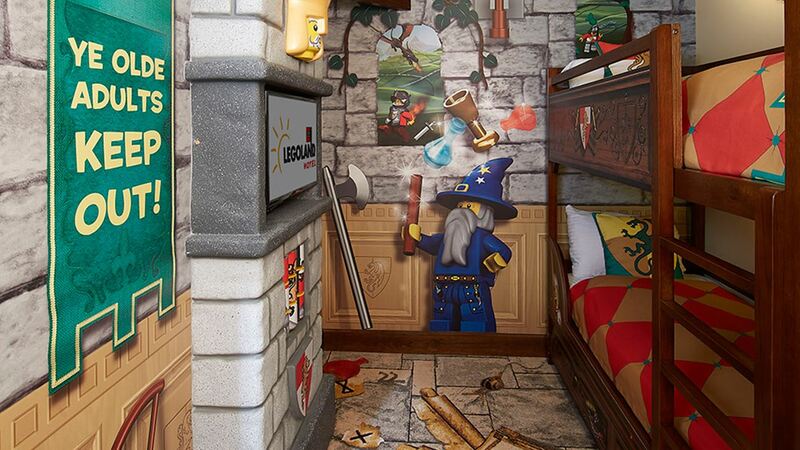 When we opened up the door to the LEGOLAND Florida Hotel room, I knew whoever had designed it must have had children of their own. The first thing you saw was a cubby area with a wall decorated to look like a castle, then a television and bunk beds. A special card with a LEGO character on the front let my daughter know the room was deemed “Monster Free.” Kids can choose from pirate, adventure or kingdom themed rooms and get busy with a tub of LEGOS while parents get busy unpacking. What many families don’t realize is that the resort has two totally different types of accommodation you can choose between. But before you get up to your room, there’s quite a party going on at the LEGOLAND Florida Hotel. The lobby is teaming with kids building creations from giant “Brick Pits” of LEGOS, a life-sized LEGO Pirate Ship, LEGO building tables, and an oversized pool with — what else — giant floating LEGOS. The lobby also features around-the-clock fun with dance parties, treats, and LEGO building competitions. The only elevator bank on the property gets backed-up, but was a strobe-light, song-filled party once the doors closed. The kids loved it, and we couldn’t help but hop around as we ascended to our kingdom room fit for royalty. Two restaurants offer family-favorite buffet style food or a slightly more upscale lounge experience. Definitely head down to the lobby for breakfast at Bricks Restaurant as early as possible. The buffet breakfast featured anything you could possibly think of from scrambled eggs to pastries, but was chaotic as families lined up and waited to be seated before it closed. Of course, when you’re traveling with an almost 23-month-old, walking across the room is also a chaotic experience. Despite managing to launch his milk at an unsuspecting little girl who shrugged it off and said they were headed to the waterpark anyway, breakfast was mostly a success. While guests lose the immediate convenience of the LEGOLAND Florida Hotel, they gain privacy and an outdoors experience at the Beach Retreat. Located a minute or two drive from LEGOLAND Florida Water Park, the Beach Retreat features a totally charming village-style layout that looks like LEGO people came to life and started frantically building cottages. 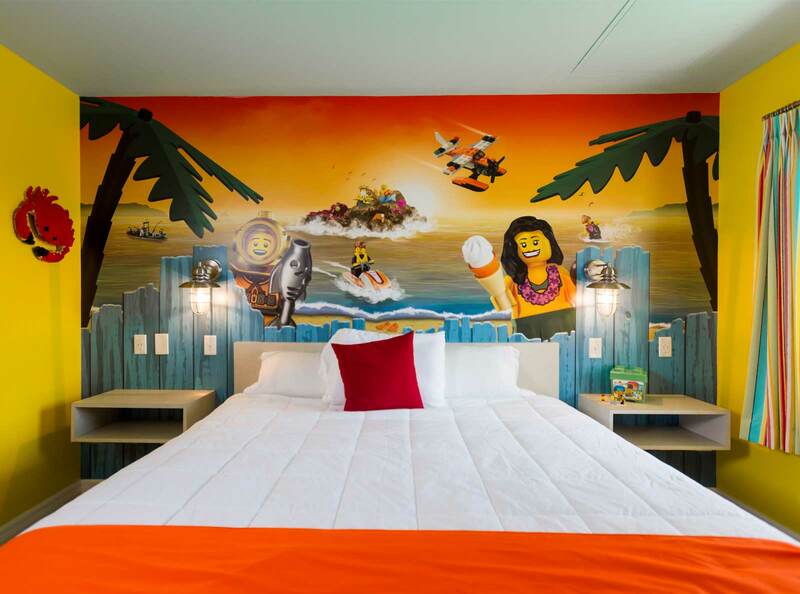 The beach-themed bungalows hold 166 separate rooms with an obsessive attention to detail when it comes to LEGO decor. Planning Tip: LEGOLAND Florida Waterpark staff told me a big volume of their business are Florida resents. Go directly after their spring break ends and enjoy low wait times. A tub of of LEGOS kept the kids busy while we checked out our room and got organized. Like the LEGOLAND Florida Hotel, the bungalows also had a kid’s-sized cubby with bunkbeds. They added a privacy curtain, making it easier to put our little guy to bed while the rest of us sat on our little porch with the door cracked so we could see and hear inside. My daughter did point out, with a heavy sigh, that there was no TV in her little room behind the curtain. Instead, she was forced to walk two feet to the central television and curl up in our bed. We told her she would pull through just fine. The rooms were fun and decked out in magical LEGO decorations, including wallpaper of a LEGO guy eating an ice cream cone. My almost 2-year-old pointed at it and declared, “Mmmhmmm!! !” which is how he says something looks or tastes good. The bungalows were cozier than I would have expected from the outside, but worked perfectly for our purposes. The bungalows are more or less the same size of a standard hotel room, along with a kids cubby with bunk beds. But what the Beach Retreat offers that hotels don’t are privacy and an outdoorsy experience. Each section of the resort features bungalows painted in different LEGO-inspired colors situated along a circular path. Families will appreciate the individual wooden playgrounds located centrally in the courtyards of the Beach Retreat. The convenience and proximity of the playground was a huge hit with our kids, and I noticed something a LEGO team member later confirmed. The front doors of all of the bungalows align perfectly so the playground is directly within your line of sight. This makes it easy for one child to play on the playground, and another to nap or watch television inside while you sit on the porch and watch both of them at the same time. Floating LEGOS were also bobbing up and down in the Beach Retreat pool, and my daughter delighted in watching teenagers build enormous LEGO cabins that they then floated across the pool. A beach with real sand rests alongside the pool, and my daughter made sure to put in the time making sand angels while still wearing her life jacket after a swim. It made for a fun evening of getting wet skin off of her while she giggled at the shower curtain decorated with surfing LEGO characters. A larger playground more suited for ages 5 on up sat behind the pool for a break from the water. The pool is also conveniently located directly in front of the property’s only restaurant and gift shop. It’s topped by a picture-perfect LEGO lighthouse — built to scale — that lights up at night. Parents can also walk up to the restaurant side window and order up a snack or drink while older kids play at the pool playground or beach within their sight. 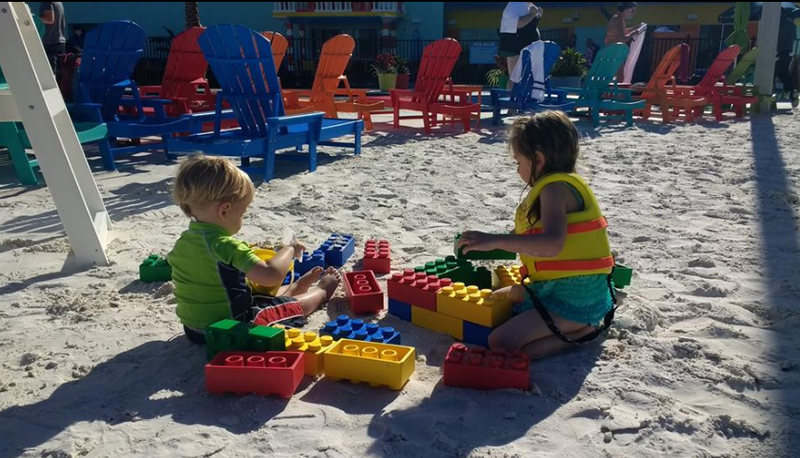 LEGOLAND Florida Hotel or Beach Retreat? That’s a tough choice, as my family loved each LEGO lodging option for different reasons. The convenience of walking from the LEGOLAND Florida Hotel to the park was hands-down unbeatable, but I loved being able to just walk outside and enjoy the Florida air at night over at the Beach Retreat without a care in the world. The lobby was certainly a lively party over at the LEGOLAND Florida Hotel, and a great fit if your kids want a lot of kids to play with and a majestic LEGO ship to run around on. Based on convenience, I would recommend families stay at the LEGOLAND Florida Hotel if you need to completely streamline getting to and from the amusement park without worrying about packing up the car. But I personally preferred the whimsical magic of the Beach Retreat and the ability to enjoy the starry sky at night while having Florida at my fingertips. Want Kid-Friendly Ideas, Attractions and Hotels for Your Florida Vacation? Sign-up and Get Our FREE Florida Chapter from Our Book, “America’s Most Popular Family Vacations”! Prev Article Prev Article Mt. Washington Cog Railway to Build Summit Hotel – True or False?